Mumbai: Lakshya Sen doesn't really talk much. There's hardly any eye contact when he speaks. But when he takes the court, he lets his racquet speak for him. On Sunday, in a much smaller hall buoyed by a handful of spectators at the Cricket Club of India badminton court, Lakshya strolled past junior world champion and off-court friend, Thailand's Kunlavut Vitidsarn 21-15 21-10 to win his first Tata Open International Challenge title. Lakshya sen strolled past junior world champion Kunlavut Vitidsarn to win his first Tata Open International Challenge title. Lakshya's fast-paced game and attacking approach from the word go paid dividends. Every second stroke was an attacking move, resulting in the swift thrashing of the Thai opponent he has faced thrice over the past three months. 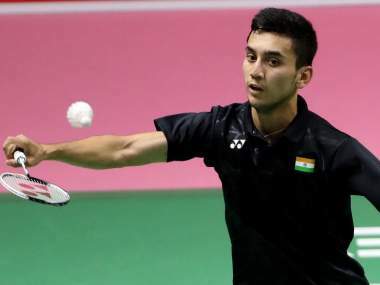 This was also his second win against Vitidsarn this season, having beaten him in the Asian Championships and recently losing to him in the junior World Championships semi-final in Markham, Canada. Same time last year, he had been in a similar situation. After winning the opening game, Lakshya lost focus and eventually the title in Mumbai. But now, he has forgotten about it. "It feels so good now, especially after getting so close last year," he says, meekly. The first challenger title calls for the former World Junior No 1 to move up the ladder to the senior circuit. "This is just the beginning," Lakshya says. With that, he meant this was the beginning of his transition from a junior wizard to a senior shuttler. A lot has changed in the 12 months for Lakshya, after all. And it's not only the physical growth but also the mental aspect of his game. Earlier, constant injuries have kept a few junior shuttlers out for considerable periods, resulting in lack of success on the senior circuit. More importantly, it's not easy for a young shuttler to take on the rigours of the senior circuit – both physically and mentally. But in Lakshya's case, any junior would be envious of the start he has got. The luxury of training under quality coaches from a tender age has paved the way for him to achieve so much at the junior level. Similar to what Saina Nehwal and PV Sindhu achieved when they were making the transition. "He's become calmer and relaxed on court," says Sagar Chopda, one of his coaches at the Prakash Padukone Academy. "That has helped him read the game much better and play to strategies much more efficiently. Take today's game for example. Vitidsarn has a deadly down-the-line drop smash which catches people off guard. Lakshya knew it comes when the opponent is at his weakest and so he was able to counter it." The 17-year-old has proven his worth at the junior level since a long time now and success in the junior circuit will only take one so far. It is the performance in the senior circuit that essentially helps a player establish himself or herself. "That will be the target next season onwards," says Vimal Kumar, who coaches the youngster at the Prakash Padukone Academy. "This title is a good confidence booster but there's much more to achieve. I feel that Lakshya can now focus on the senior circuit. Also, to play both juniors and seniors is very tough." The World No 115 participated in four different junior international competitions and very few senior events too. Along with the Asian Junior Championships title, the most prominent of those four was his silver-medal winning effort at the Youth Olympics in October. Competing in the senior events through the 2017 season helped him gauge the mental toughness needed to take on a higher-ranked opponent. Along the way, he even squared off against the legendary Lin Dan, twice – on each occasion he stretched the veteran two-time Olympic champion to three games. "That experience was an eye-opener," Lakshya asserts, "Playing at the senior level really helped me figure out where I stand as a player. And what I need to change." Since then, Lakshya has used the invaluable experience of playing against senior opponents against his junior counterparts. Notably, the final he played against Vitidsarn turned out to be the shortest match he played at the CCI courts in the tournament. Credit goes to his preparation before the final and how he made full use of the smaller arena in Mumbai that allowed him to constantly target the backhand corner of his opponent. "Lakshya didn't give him the pace today," Kumar says. "Vitidsarn's style is that he likes someone to really hit at him, then he will counter-punch. But Lakshya kept changing the pace and wouldn't give him the rhythm. Right now, his temperament is better than many of the younger players." As he begins his journey to the world of senior circuit, his coaches believe that there's still a need for Lakshya to focus on strengthening his lower body and the defensive aspect of his game. "He still has a long way to go but he has made a mark," Kumar says. "He has made a slight breakthrough. The others are all wary of him, they've noticed him and they know that they have to be careful. That fear factor is there, but now Lakshya has to build up that knack." Now that he has made his mark, Lakshya's camp has realized that it's time to try and translate the success he has had at junior level onto the biggest stage of all. Given Lakshya's potential and the little exposure he has had at the senior level, the focus is on building a long-term future instead of competing at next year's World Championships, like his off-court friend Vitidsarn.